School tours may be arranged for groups of 20 or more children. To ensure the safety and enhance the enjoyment of your group, Please familiarize yourself and your students with the Funk Heritage Center Group Tour Safety and Behavior Guidelines prior to arriving for your tour. Teachers may want to copy pre-visit materials to use in your class before the field trip. School field trip admission fees for students range from $6 tor $9 depending on the tour and options selected. Admission for adults is $6.00 for adults. Teachers are admitted free of charge. Tax is added if your group is not sales tax exempt. Discounts are available for Title I schools. Special school programs including Pioneer Days and the Georgia History Timeline, have different fees. Tours for 2nd, 3rd and 4th grades are listed below. Additional options for both indoor and outdoor programs are listed. Group tours for middle school and high school students may be arranged by contacting our reservation specialist at 770.720.5967. Students view a 15 minute film on the Southeastern Indians and see exhibits in the Longhouse and in the Hall of Ancients. They will learn about the types of shelters the Cherokee and Creek Indians built, how they hunted, fished and farmed, what they wore and how they traveled. They will discuss resources in Georgia's regions. The group will be introduced to the culture of these people, the impact of European settlements on the Native population. They will also see how archaeology has contributed to our knowledge of the past and why the environment influenced how and where the Native Americans lived. This tour includes a 15 minute film on the Southeastern Indians. 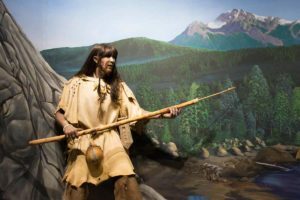 In the Hall of Ancients, students will learn how American Indians used the environment to obtain food, clothing and shelter. Docents explain the cooperation and conflict between European explorers and Native Americans. They will also discuss Cherokee and Creek Indian cultures and trading. 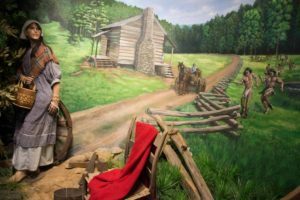 In addition to seeing a 15 minute film on the Southeastern Indians, students will learn about the removal of the five civilized tribes that included Georgia's Cherokee and Creek Indians. They were relocated to Indian Territory in Oklahoma. They will also discuss trade between the American Indians and Europeans. 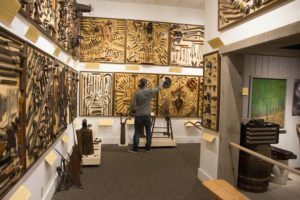 In the Sellars Tool Gallery, docents will focus on simple machines and their uses included in the curriculum of the 4th grade. Indoor Additional Program Options - For a $2 additional fee per student/adult the following 30 minute programs may be added to a school tour. Sellars Tool Gallery and Rogers Art Gallery may be added to tours 1 and 2. Pioneer Music may be added to Tour 1 or 2 for an additional charge. Children in K-3 enjoy the program and will learn about instruments used by pioneers, simple songs and dances. The Iron Industry is a special program available for 4th and 8th grade students. Our blacksmith will tell students about the history and production of Georgia's iron industry. Outdoor Additional Program : For a $3 additional fee per student/adult the 1 hour History Alive may be added to a tour. Students will visit the Appalachian Settlement, weather permitting, to see a living history program, History-Alive. Children will learn how the Appalachian settlers lived and worked during the 1840's. They will visit a historic log cabin, the blacksmith shop and students will learn how pioneer families coped with daily difficulties and their legacy. Living history volunteers dress in period clothing and demonstrate various crafts people when available. 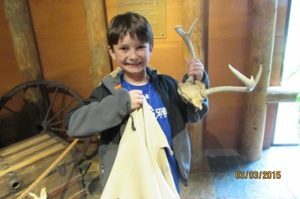 Otherwise, docents will explain how frontier families lived in the 1840s. This program is not available from November 15 until March 15 and during the summer months.